New four-wheel drive (4WD) shift linkage is adjustable to compensate for linkage wear. More efficient cooling due to a new aluminum radiator that provides more efficient cooling. Improved console shift bracket ensures sure, firm shifting. New, quieter cooling fan provides decreased noise when parked. Flip-up seats are now available. Flip-up seats are standard for both passenger and driver sides. Standard for 2030A, 2020A, 2030A GPS, and 2020A GPS models. Easy to flip up to keep seat clean and dry. An increase of 1.12kw (1.5 hp) over previous model year. Exhaust muffler has been rerouted. Serviceable without raising vehicle bed. Increased from a 101.6-mm (4-in.) filter to a 127-mm (5-in.) filter. Has been moved to the right side of unit, now found outside of frame. Easier access for daily check and evaluation activities. Maintaining a golf course is a very demanding job, from filling bunkers to hauling landscape rock to spraying 300 gal. (1135 L) of water on fairways. Demanding jobs require rugged vehicles that are up to the challenge of high-payload capacities, and the ProGator™ 2030A delivers. Working with higher payloads requires a tough power plant. A powerful 17.6-kW (23.6-hp), 1115-cc diesel engine is the heart and soul of this strong package. 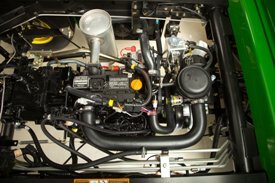 Featuring a liquid-cooled system, overhead valves, and full-pressure lubrication, this diesel engine provides power in a reliable and durable package. 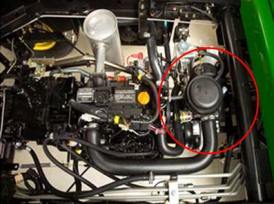 The engine package features a large 30.3-L (8-US gal. 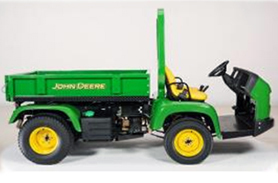 ), Environmental Protection Agency (EPA)-compliant fuel tank, providing plenty of on-board fuel for those long days of spraying fairways and roughs with minimal stops to refuel. And on those long days, operators appreciate comfort and minimized vibration. The engine mounting system is rubber isolated to reduce vibration at the operator station, enhancing operator comfort for the long haul. Automatic glow plugs and direct fuel injection provide for more efficient combustion and easier starting on cold, early mornings. 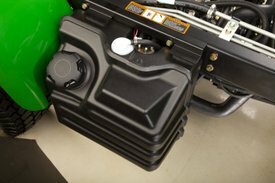 To protect the engine, a canister-style, replaceable air filter and standard rain cap limits the amount of debris and water exposure, leading to long, durable life. When working in tough, dusty environments, a standard air-restriction indicator provides guidance as to when the air filter may be plugged. * Engine horsepower is provided by the engine manufacturer for comparison purposes only. Actual operating horsepower will be less. 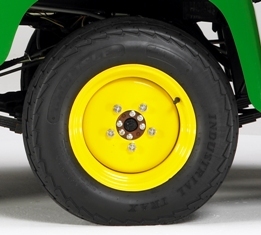 The ProGator™ Utility Vehicle features a premium disk braking system that consists of four, 190.5-mm (7.5-in. ), disks. The disks are cast from vibration-resistant G3000 grey iron and four identical single-piston floating calipers. The brakes are hydraulically actuated for easy pedal effort and excellent performance. The service linings are constructed of a proprietary noise-resistant organic blend for an excellent mix of life and performance. Brake pedal feel is enhanced with large caliper pistons and flexible brake lines improve routing efficiency and allow for ease of service. The parking brake lever is conveniently located in the center of the operator station and features a pistol grip handle for maximum comfort and ease of use. The parking brake system utilizes a ball ramp-style mechanism, meaning no adjustment at the mechanism itself, only at the equalizer. 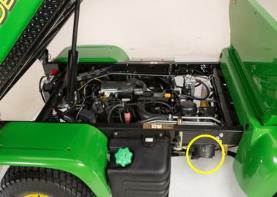 Routine maintenance can often require additional hours for a technician. With sealed bearings throughout the machine, the ProGator™ Utility Vehicles will save the technician plenty of time. 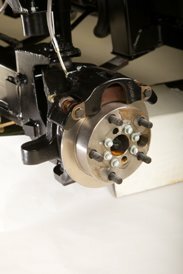 2WD machines feature all sealed bearings and no grease zerks, while four-wheel drive (4WD) machines have only three grease points on the 4WD shaft. Filling brake fluid is also quick and easy and requires no tools. 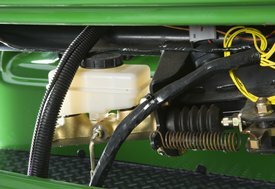 The front grille of the ProGator is removed simply by pulling it outward from the front of the machine, providing easy access to the brake fluid reservoir. All other daily service points are accessed by simply lifting the cargo box and securing with the lift cylinder safety support. This provides quick access to the coolant level check, engine oil dipstick, and air-restriction indicator. 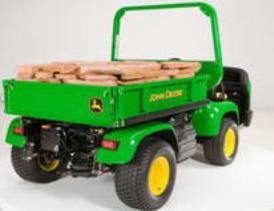 The ProGator™ heavy-duty utility vehicles feature an optional cargo box for hauling items on the golf course. 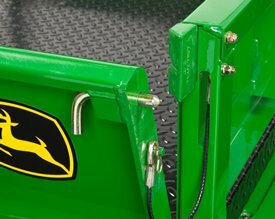 The cargo box attaches to the ProGator easily, utilizing only two rear pivot pins and one lift cylinder pin. 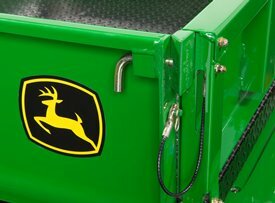 This allows quick and easy changes between ProGator attachments. 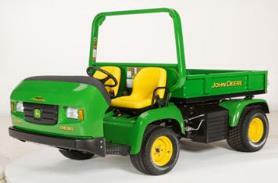 A 16-gauge steel frame provides added strength and durability. A standard hydraulic lift and lower cylinder allow for easy lifting of the cargo box to dump sand and other items from the cargo box quickly and easily. The optional tailgate release kit allows for a dump truck mode, where the tailgate automatically opens from the bottom when the tailgate is raised to allow items to flow out of the box. The tailgate then automatically closes when the box is lowered for fast and efficient operation. For normal tailgate operation, opening and closing the tailgate is easier than ever. An innovative retractable pin system is the key. A spring-loaded L-pin is located on each end of the cargo box. To open the cargo box, simply pull the L-pins inward and lower the tailgate. Closing the tailgate is even easier. The angled striker plate design allows the L-pins to automatically retract when shutting the tailgate. When the cargo box is fully closed, the springs will pull the pins into their locking position. 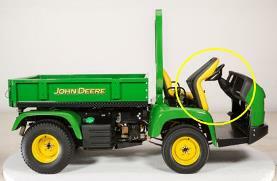 This allows for a one-handed closing of the tailgate, similar to that of a pick-up truck. 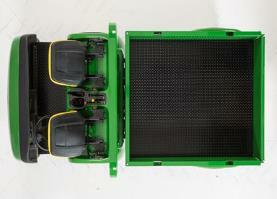 A bedliner can be ordered as an optional attachment for the ProGator machines. 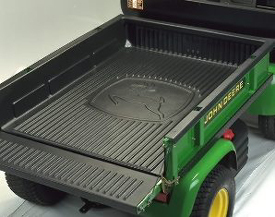 The high-density polyethylene bedliner is stamped with the John Deere logo and protects the steel cargo box and paint from dirt and debris. The bedliner is designed to wrap around the bottom of the tailgate, preventing gravel and other debris from getting trapped under the bedliner. The bedliner ribs are tapered, allowing materials to flow freely out of the cargo box when it is lifted or being cleaned. 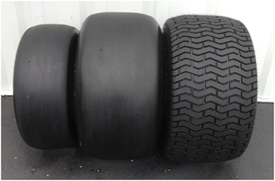 Smooth front 22x9.50-12 front steering tires offer reduced turf damage. Traction in some conditions will be limited. 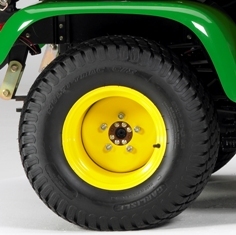 Smooth rear 26x14.00-12 rear drive tires for a wider footprint where the least amount of turf damage is required, which is helpful for sprayer applications on the greens. Traction in some conditions will be limited. Fairway rear 26x14.00-12 drive tires offer a wide footprint with minimal turf damage when sprayers or topdressers are used. 4-ply ratings offer increased load carrying capacity with improved wear characteristics and provide extra protection against flat tires. Required tire option can be declared during machine configuration.